Exactly same as picture ! Comes with one pair of Chrome 6.5" round style 4x4 work fog lights ! Dimension: width: 6" / height: 6.5" (from top to bottom) / depth: 5"
Kit included: two pair 4x4 fog lights, h3 bulbs, on/off switch, dual relay, wiring harnesses and necessary hardware. 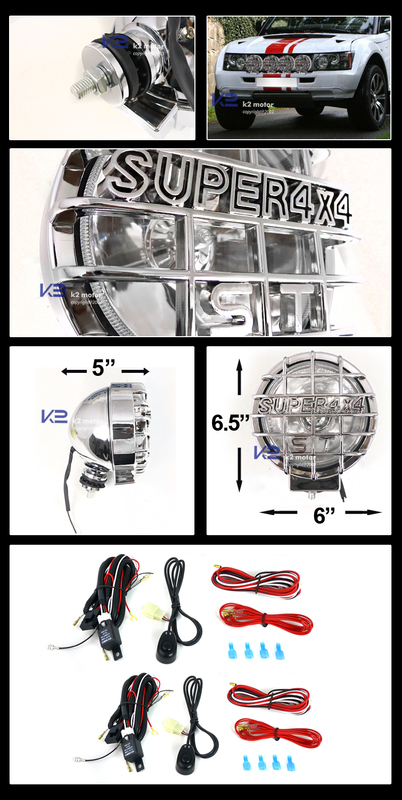 Product: Chrome Round Fog Light Super 4x4 Lamps + Wiring. Descriptions: This Set Of Fog Lights Will Help Improve Visibility During Night, Rain, Dense Fog And Snow. Try A Set Of Our High Quality And Easy To Install Fog Lights Kit! Made To Be Water Resistant And Shock Proof, This Set Of Fog Lights Is Also A Great Way To Customize The Look Of Your Car!